As some of you already know, I’m a Filipina. I was born and raised in the Philippines, and like most people there, I’m a Catholic. I grew up observing Catholic traditions like abstaining from meat and all food made from meat on Ash Wednesday and all Fridays of Lent. This is done as an act of repentance and renewal. You might be asking why abstinence is set on Friday. Friday is believed to be the day that Jesus died, so Catholics abstain from eating meat (flesh) on Fridays during Lent out of respect for Jesus who gave up his own flesh to pay the price of humanity’s sins. 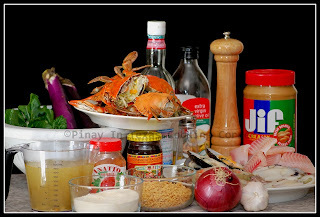 For this first Friday of Lent, I will share with you my version of Seafood Kare-Kare. Kare-kare is an authentic Filipino dish with a sauce flavored and thickened with ground roasted peanuts and toasted rice flour. When I was growing up, my parents usually cooked the ox tail, tripe, beef or pork leg version of kare-kare. When I was in college, I was invited by a friend to have lunch with her family at Barrio Fiesta. That’s the first time I was able to eat seafood kare-kare…and gosh, I fell in love with it the very instance I tasted it. Since then, I prefer the seafood version much more than the meat one. 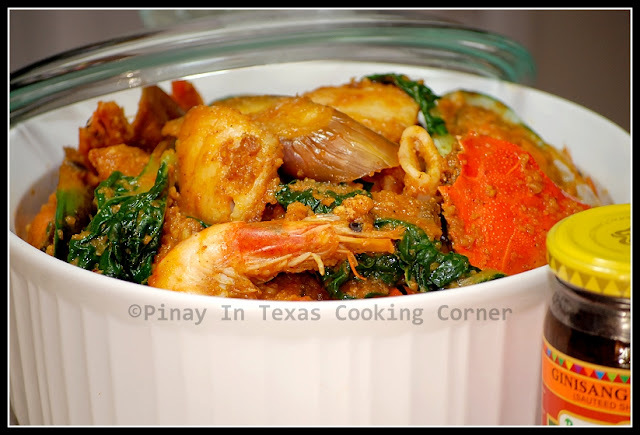 Aside from the fact that I love seafood, this version of kare-kare cooks a lot quicker! * I shared this on Simple Lives Thurday, Friday Potluck@EKat's Kitchen and Feed Me Tweet Me Follow Me Home Friday. 1. In a saucepan, boil crabs in 3 cups water and 2 tsp salt until the crabs turn to red. Set aside the broth. Remove crabs from pan. Let it cool and cut into halves. 2. While boiling the crabs, fry tilapia fillet in ¼ cup olive oil on a large skillet until both sides are brown. Remove from pan and set aside. 3. In the same skillet, add string beans. Stir fry. After about 3 minutes, add eggplants . Stir fry until almost cooked. 4. Add pechay and stir fry for 2-3 minutes more. Remove vegetables from skillet and set aside. 5. Simmer shrimps, squid and mussels in the same skillet just until the shrimps turn pink. Remove from heat and set aside. 4. Pour 2 Tbsp olive oil into a large saucepan. Add garlic and sauté until light brown. 5. Add onions and sauté until almost translucent. 6. Pour in the broth and diluted annatto powder into the saucepan and bring to a boil. 7. Add the fish sauce, peanut butter, ground peanuts and ground rice. Simmer for 10 minutes, stirring occasionally. 8. Add all the cooked seafood and vegetables except the tilapia and cook for another 3 minutes while carefully stirring to evenly coat with sauce. 9. Add salt and pepper to suit your taste. Add tilapia. Carefully mix with other ingredients. 12. Serve hot with rice and shrimp paste with a sprinkle of lemon. Enjoy! YUM, Tina! I've never heard of seafood kare kare, but this looks scrumptious considering I love seafood too!! I will definitely try this one of these days!! Thanks for sharing! One complete meal by itself with plenty added inside. Will be great with white rice. The flavours in this dish sound just wonderful! Thank you for sharing it and for linking up to Feed Me Tweet Me Follow Me Home Friday. Have a lovely weekend. This sounds wonderful! Thanks for sharing with Simple Lives Thursday. We love Kare Kare. I'm going to have to try it with seafood. Thanks for sharing the recipe! Wow this sounds yummy! I'm gonna post it for my foodie fridays post today. Thanks for sharing! Also we'd love to have you add your recipes to our World Food Thursdays over at www.helladelicious.com you always have such delicious food! Hi Tina! I live in Texas too. I love kare-kare but I seldom cook it because my husband isn't a fan of kare-kare. I would like to try this seafood kare-kare but then, I remember my husband isn't a fan of seafood, well except for shrimp. I just found out about food blog last night as I was looking for easy-to-make cassava cake recipe. I wish we're neighbors so we could cook together. Hi Hazel! Welcome to PiTCC! So where in Texas are you?